Organized gatherings—whether they’re flavored as conferences (including “unconferences”), summits, camps, or meet-ups—are infused with the possibilities of inspiration and knowledge. One such gathering is CreativeMornings, which I’ve consistently endorsed as my kind of design conference. Held monthly, it is a regular invitation to evoke vision and build knowledge. Bolstered by local pride and neighborly attendance, CreativeMornings also inspires reconnecting. During the reception of the fourth CreativeMornings/Chicago at Threadless’ workspace, I noticed a former co-worker. While this is not always a guarantee of a pleasant chance encounter, in this case, it was sweet serendipity. I reunited with Stephanie Di Biase, a creative director. 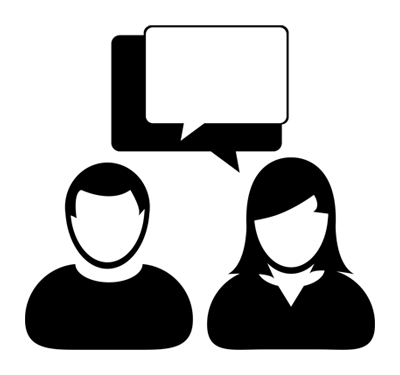 We chatted about our current work, since leaving the employer we shared. We had both happened to sign up to see the CreativeMornings/Chicago Talk by Jake Nickell, who co-founded Threadless. This was a welcome coincidence. One of Jake Nickell’s proclamations, during his presentation, was: “Make with friends.” Friendship was a definite part of Threadless’ inception and gradual success. Five months later, Stephanie and I reunited. This time, it was at my request, to talk about collaborating on a personal project of mine. 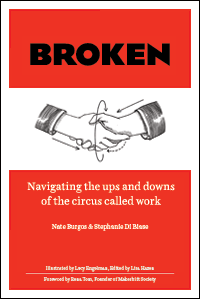 After close to two years, the result is a completed book called BROKEN: Navigating the Ups and Downs of the Circus called Work. Reflecting back, reconnecting with Stephanie at CreativeMornings, where we listened to Jake’s nudge to create with friends, in our shared city of Chicago, constituted an influential series of of circumstances that ultimately resulted in our book. 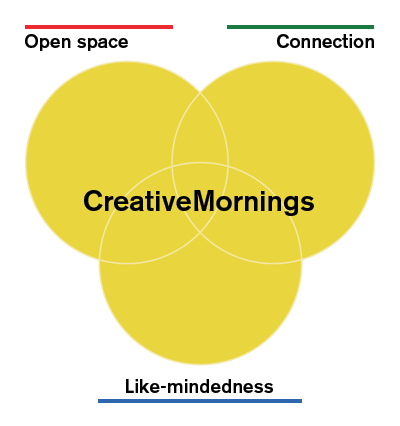 CreativeMornings says it provides “an open space to connect with like-minded individuals.” Open space. Connection. Like-mindedness. This social algorithm remarkably served my musings about what to do next—what creative project to consider getting real. Aspiring to meet a would-be collaborator at a gathering is a romantic idea, but it isn’t a flat intention. A gathering, like CreativeMornings, can play a supporting role in the unfolding rush to imagine the making of something, something wonderful in the worlds of like-minds, and beyond. If a gathering’s tasks of giving inspiration and knowledge are fulfilled, a good gathering becomes a life event. It can be a preview of possibility, explored and realized. Tap into, what Seth Godin called in his CreativeMornings/New York Talk, “convening power” with this list of gatherings related to art, business, craft, storytelling, technology, and more. This is the second post, after the launch of BROKEN, that reflects on how this book was made. More to come in this series about aspects related to writing and self-publishing. Read the previous write-up The Evolution of BROKEN. Here’s to working better → BROKEN: Navigating the ups and downs of the circus called work. Buy the book now! If you liked this lovingly-made write-up, show your appreciation by helping to support my labor of love—Design Feast, which proudly includes this blog. Learn more.